Please note: Most navigation systems do not recognize “Transistorweg 5”. 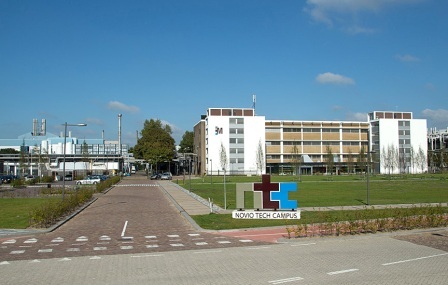 As an alternative you can use the address of the location “Jan Massinkhal” opposite to the entrance of Novio Tech Campus, which is “Nieuwe Dukenburgseweg 5, Nijmegen”. You pass a petrol station. Keep in right lane! At Novio Tech Campus follow the signs to building “M” (take the 1st left). Follow this road up to the to the second barrier at your left hand-side to enter the car park. If the barrier is closed, please ring SMB (nr. 4) so we can open it. To leave the parking you drive close to the barrier. It will open automatically. On the opposite to the entrance of Novio Tech Campus is building “Jan Massinkhal” with a free parking lot. Ring and tell you come for Novio Tech Campus and they will open the barrier. From Nijmegen central station please take a bus to Nieuwe Dukenburgseweg. Choose bus stop “Jan Massinkhal”. This bus stop is opposite to the entrance of Novio Tech Campus (red arrow on picture left). It’s a 2 minute walk towards building “M”. It is also possible using train station ‘Goffert’ from Den Bosch Central Station or from Nijmegen Central Station. Walk from the train station to building Ampleon and follow the line in orange on the map. 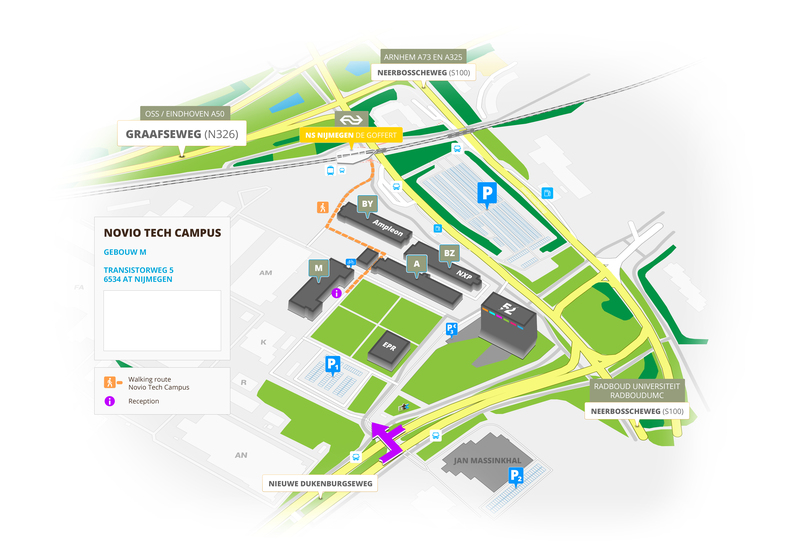 At the right you’ll find building ‘M’ and Novio Tech Campus. Please click here for a download as pdf.